Make sure customers retain your Company branding when reading their favourite book's, and you can be sure business is sure to improve for the coming years. 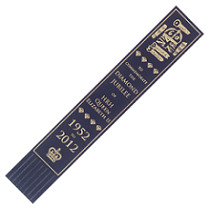 Our Jubilee Printed Bookmarks are a quality 23cm leather bookmark that's designed to make a dazzling impression with your brand-name and logo. To mark the event of Queen Elizabeth II's 60 year reign, why not mark this occasion in the pages of history with your Corporate crest on its surface also? Great business gift for any customer! For a FREE QUOTE, please fill in the form regarding our Jubilee Printed Bookmarks and we'll be able to help you. Why not try out our other promotional Diamon Jubilee products?